Perhaps some numerologists understand the hierarchy of street addresses, but for most New Yorkers there is little magic. Some of the best buildings are known by their names, not their numbers, like Riverhouse at 435 East 52nd Street, or the Time-Warner Center, which has a variety of Columbus Circle addresses depending on whether your looking for an office, an hotel, an apartment, or a store. A very low number, of course, indicates that you are close to the beginning, which might be a good thing, but numbers can be misleading. One Fifth Avenue, for example, is actually half a block away from the base of Fifth Avenue at Washington Square Park and 1049 Fifth Avenue is not on the avenue but is a mid-block building on East 86th Street. We've all seen those charts that let you know what is the nearest cross-street for an avenue address, but they are a bit like VCR programming controls - far from simple. There is almost a reverse snobbism in building addresses. Some buildings proclaim that they are the Clarendon, or the Lucida, or the Brompton and shy away from a numbered address, presumably for marketing reasons, or whatever. 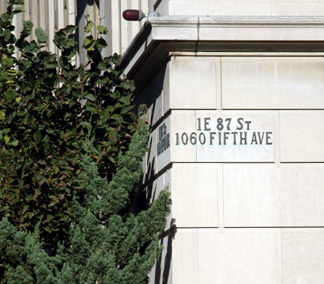 Unlike some European cities where there is a fine tradition of enamel plaques on the corner of buildings, New York City has no standards about letting the public know what a building address is. Sometimes, it is proclaimed on a building's canopy. Sometimes it is engraved in an escutcheon above the entrance. Many buildings in SoHo have their street number engraved in stone several floors up at the corners. A few buildings, however, do it right. 1060 Fifth Avenue, for example, not only has its entrance nicely applied to its limestone base in bronze at the corner but also tops it with its side-street address - 1 East 87th Street - and it does so on both the avenue and the side-street just in case its nice sidewalk landscaping obscures part of one. You would think that a building would take some pride in its address. Put it in lights. Engrave it in stone. Project it with lasers onto the street. Send it out wirelessly to passersby&.